Come See the Strange Thing! Posters called out to the Husband and me once upon a time at the county fair. We walked up to the counter, plunked down our two bucks, and entered the tent. Pictures and articles were plastered on the wall. I didn't want to read. I wanted instant gratification. Where is the Strange Thing!? Then. . . . Eeeeeeeeeeeew! On display was a shriveled up something that looked like a dried up armadillo. Yuck. The Strange Thing! was said to be a blood-sucking creature called a chupacabra. Was it real? Qué sera, sera? The Internet mostly says the chupacabra is an urban legend, but that doesn't keep the curious from conducting field research. Years later the Husband and I crack up whenever one of us brings up The Strange Thing! Have we learned our lesson? Will we plunk down hard-earned cash to see the next Strange Thing! at a county fair? Qué sera, sera? By the way, we have our own little strange thing sitting on the kitchen window ledge. (Did you think I'd ever get to that?) It's definitely for real, our strange thing is. It's a citron, a kind of lemon, which also goes by the name of Buddha's Hand. Don't let the photo fool you about its size. It's nearly three inches long and two-and-a-half inches high. Pretty strange, but kind of cute. Giggle. 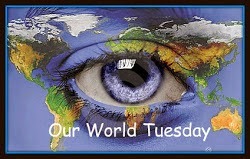 Hooking up with Our World Tuesday. Click here to check out other participants. Thank you, OWT hosts! That thing is strange. Are you going to eat it? I'll be sure and send you $1. hahahaha. I'll probably let it sit there until it shrivels up. That's modern art made by nature, lol ! 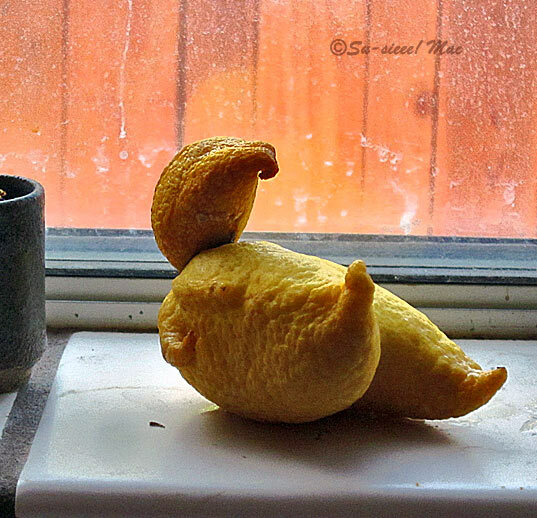 Without your explanation, I wouldn’t see your “strange thing” a citron. Looks like mutation, but I like “modern art made by nature” by Gattina. Me, too, Yoko. What Gattina said. hahahaha. I resemble it when I get up from the floor, so I try not to get down on the floor. Very true, can never say never. You know your Buddah's Hand!